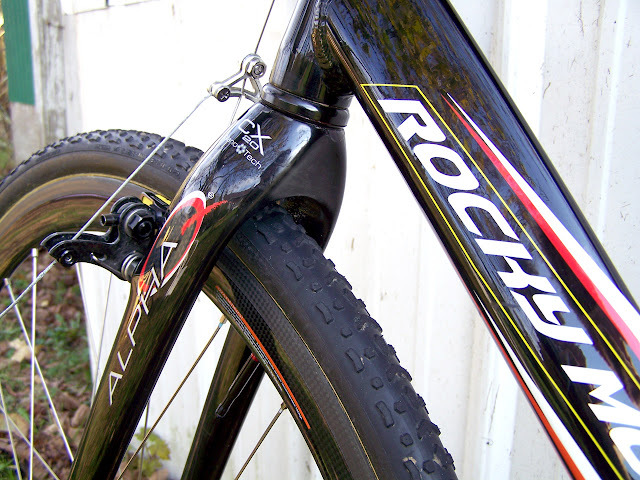 Saw this Richard Sachs cyclocross bike on eBay ---- but the seller has 0 feedback. So I posted the question to the Slowtwitch.com forum ---- asking if people thought it was a scam. e-Richie (Richard Sachs' online pseudonym) responded: it's not a scam atmo. the woman's late husband bought it used back in 2002 or so. Honestly, though, the first three make up the reasons why most people ride a singlespeed cyclocross bike. 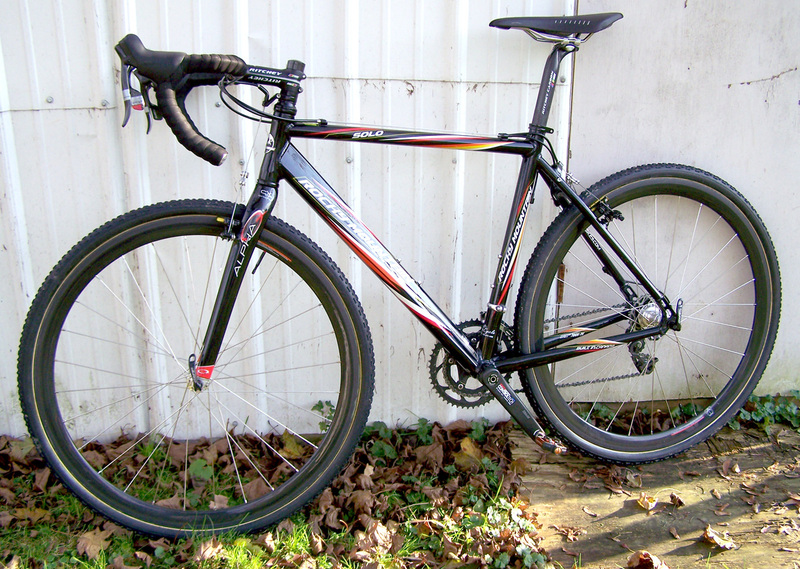 If any of the above reasons appeal to you, but you're not exactly sure how to build your bike to ride singlespeed cyclocross (here on out abbreviated SSCX) this is your DIY or how to guide. Below, I've saved eBay searches for you, by clicking the link it will take you to eBay and perform the search for the item you just read about. 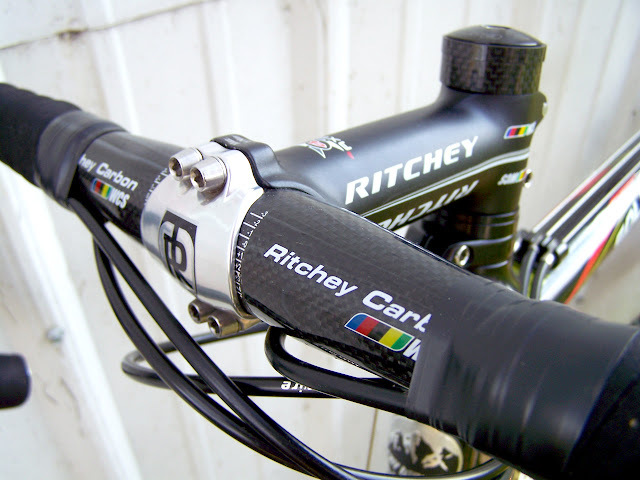 First, you need a cyclocross bike or frame. You can basically convert any cyclocross bike into a SSCX bike. 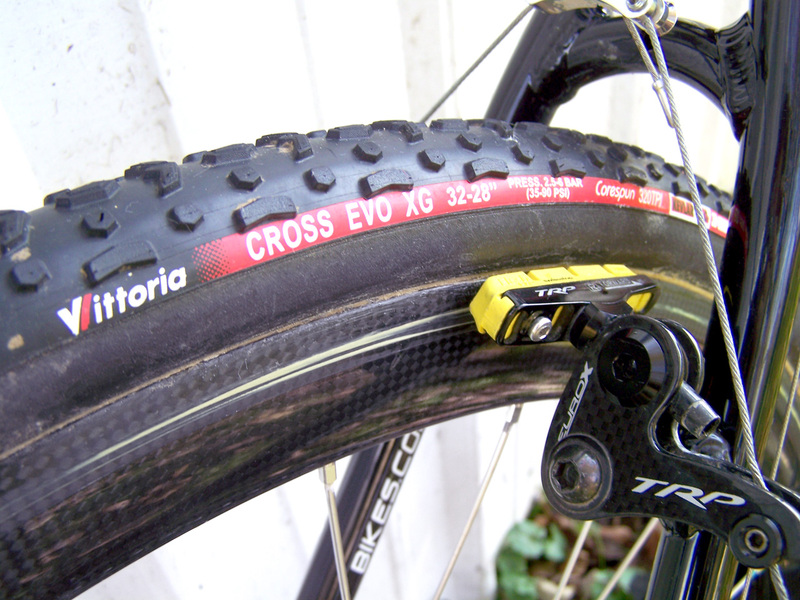 Even a bike with vertical dropouts (most bikes now days) can easily be converted to SSCX. Congratulations, you can now brake! Next, you'll need to make some changes to your drivetrain (front chainring, rear cassette) Regarding the front chainring, you'll need to change the ring first. Most cyclocross bikes come with 48 and 39 teeth. Neither of those will really work as a single ring. Most racers use either a 44 tooth or 42 tooth front ring. So you'll need to buy one of those (click here to search eBay for one). 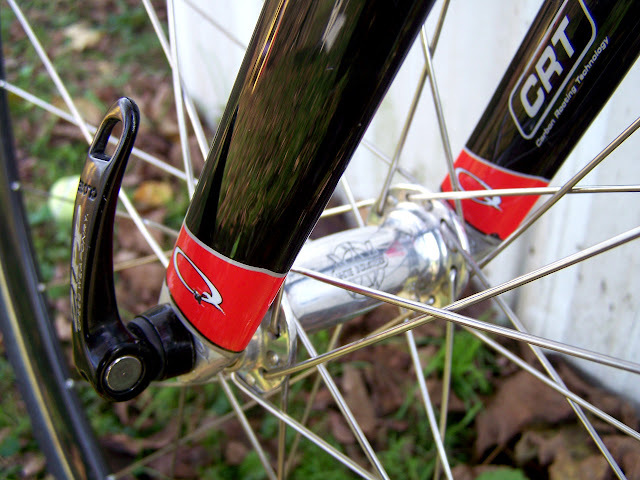 Make sure you get a new ring that will fit your current cranks. 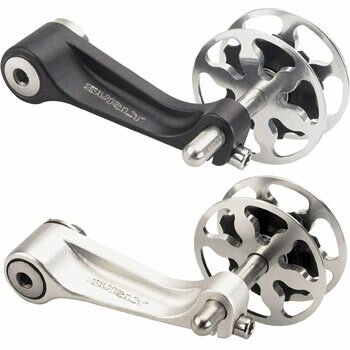 Most likely, your cranks will either use 130 BCD or 110 BCD rings. Either way, you'll need to determine the size cog to buy. This largely depends on your fitness, amount of hills where you're riding and racing cyclocross and desired pedal cadence. A good way to determine the cog size is to determine what feels comfortable with a 42 tooth front chainring using the cassette you currently have. Find a rear cog in your current cassette where you can get up the hills and also get up a decently high speed for the flats and pavement sections of the course. You're set, all of these modifications can be done by you at home with minimal tools. One of the advantages of doing you're own wrenching is that when it falls apart you can only blame yourself. Let me know in the comments if I missed something. 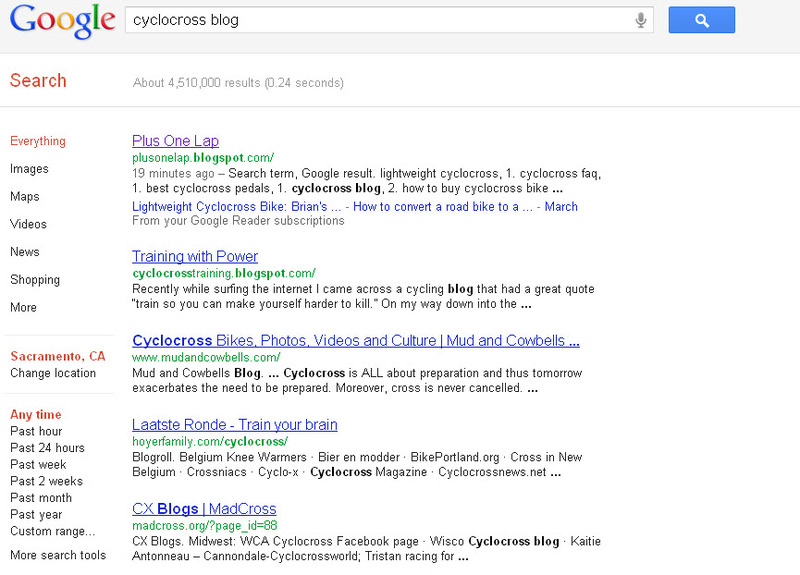 Six years ago, November 2005, I started this little personal blog devoted to my experience with cyclocross. 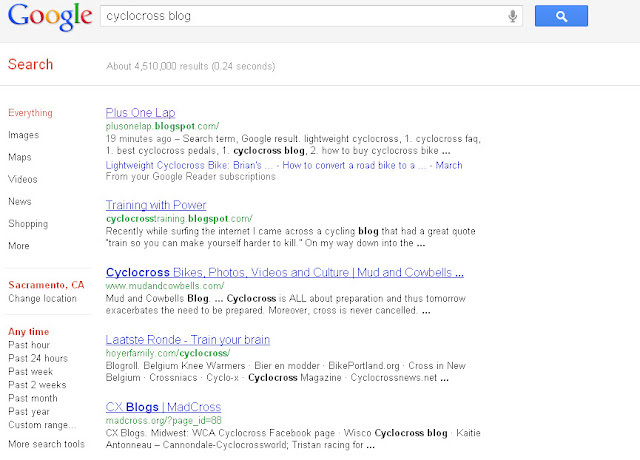 Readership increased and Google started ranking me higher and higher up the results page. While, I'm not nearly as devoted to updating the site as I once was, I know you all forgive me. For those that were some of the original fans (and are still here to appreciate it), I've returned the colors back to the original black/white/red theme. Temporarily at least. ...don't currently even own a cyclocross bike. I hear your gasps of horror and they shame me. Through three major moves (Sacramento to Portland Oregon to Boston and then back to Sacramento), the herd has thinned. You'll be happy to know that I do still own bikes and I still ride the Raleigh conversion cyclocross beast for transportation purposes here and there. Though even that has thinned lately as well, with purchasing our first home and expecting a baby girl in February, I've been busy. Back to the content and lack of updating --- I need your help with that. We'd all like to see your awesome cross rig, but to do that you need to email it to me at plusonelap at gmail dot com. Also, are there any ladies reading this? I'm not sure if I remember receiving one reader ride from a female, that's you're fault cross-chicas, not mine. 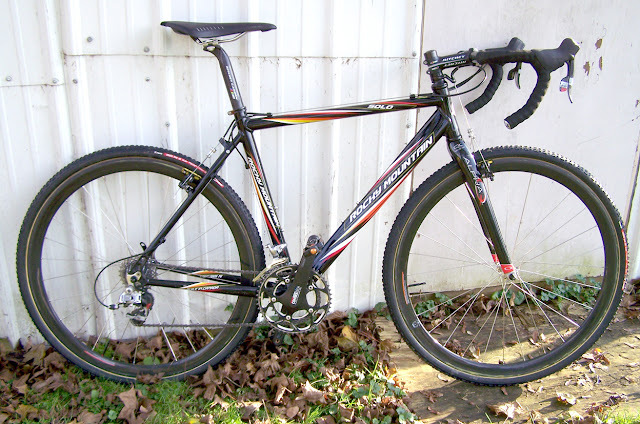 You know, I'll start an entire "gallery" of women's cyclocross bikes so long as someone sends me one. And it doesn't even have to be under 18 pounds or handmade. It could even be submitted by a doting hubby or boyfriend who does read this. One last thing, due to the lack of posts on my part, I recommend subscribing to the site via Google Reader or the like. Hi, love your site. Best way to waste time is looking at bikes, when you aren't riding them. Here's my submission for the sub-18lb 'cross bike gallery. I wanted a bike from a Canadian company, and liked the colour scheme on this model. As I am primarily a duathlete and TTer, this is also my road bike. With decent road wheels and tires it gives up little to my road bike and consequently I ended up selling the road bike. I use standard compact gearing as I need the 50T on the road. It comes in at 17.2 lbs.